During its July 26th meeting, the RSCVA Board of Directors received the organization’s annual report on the state of tourism for Fiscal Year 2017–2018. Visitation trends have continued climbing. This past May for example, Washoe County experienced year-over-year increases in visitor volume (up 2% to 426,581 travelers) as well as more cash room nights (up 2% to 305,572). Both metrics demonstrate the highest statistics of the last 10 years and the interest people have in visiting our unique and enjoyable destination. 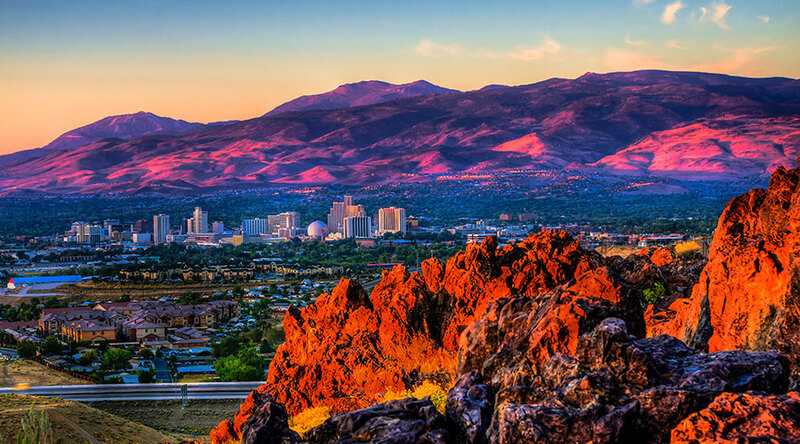 Perhaps the most significant development is the continued rise of the average daily rate (ADR) in northern Nevada, which increased nearly $12 per room night from May 2017 to May 2018. Continuing to deliver positive results, the RSCVA meetings and conventions sales team surpassed its May goal for future convention and group bookings, securing 33,333 room nights for future years. Your RSCVA CEO gave a brief presentation to the Board about the convention booking process and the newly created marketing tools the RSCVA has developed to help and promote the utilization of room blocks contracted by conventions that meet in our destination. Conventions and trade shows are requiring more and more marketing support from host cities they select for a future convention. Over the course of several months, the RSCVA has refined the methods in which we help our clients after the sale has been made and the group has contracted to meet here. In addition to traditional public relations support and providing destination collateral as many other cities do, the RSCVA is also actively supporting conventions that choose to meet in northern Nevada with customized campaigns appearing on a wide menu of social media platforms, highlighting activities with compelling photography and fully custom video, as well as a strong presence in digital and print advertising. All this is developed and produced in-house here at the RSCVA. The recent onboarding of a digital production specialist, with a background in television news, has proven to be a benefit in the conceptualization and production of custom videos, which is now a much more efficient process, in terms of effectiveness, creativity, cost and time. These efforts help set Reno Tahoe apart from competing destinations and help us accomplish our promise and mission to provide the very best in customer satisfaction. Other news from our most recent Board meeting can be found below. Thank you for your continued engagement with the RSCVA, and your passion and interest in Reno Tahoe. The RSCVA Board of Directors re-elected Washoe County Commissioner Bob Lucey as Chairman of the RSCVA Board of Directors. Mr. Lucey is Commissioner of District 2 and has been a member of the RSCVA Board of Directors since 2015. Joining the RSCVA Board in 2014, Ed Lawson was re-elected Vice Chairman. Mr. Lawson has been a member of the Sparks City Council since 2010. Harrah’s Reno Hotel and Casino Vice President and General Manager Lee Dillard was elected as the Board’s Secretary and Treasurer. Mr. Dillard joined the Board in 2017. The RSCVA Marketing team reported the success of the June Influencer program, in which six social media influencers explored the destination, showcasing the unique elements of Reno Tahoe. The success of this program resulted in 12.1 million impressions on social media, 251,761 engagements from 369 total social posts, and 247 images for use on Reno Tahoe brand platforms. Influencers were invited from the RSCVA’s key growth markets of Seattle, Los Angeles and the San Francisco Bay Area, and all have a national and international following. EMC Research presented the results from the latest brand tracking survey, conducted in the San Francisco Bay Area, Los Angeles Basin and Seattle markets. The results show that awareness of the Reno Tahoe brand has increased, specifically in the Bay Area and Seattle markets, since the last similar survey conducted in October 2017. Traditionally Reno Tahoe’s largest feeder market, the San Francisco Bay Area continues to have the largest proportion of potential repeat visitors. In the Los Angeles area, two-in-five people surveyed can be identified as potential new visitors, along with one-in-three in the Seattle area. Advertising efforts demonstrated a positive impact in each target market, specifically in the new markets of Los Angeles and Seattle, producing highly positive ratings and favorable opinions of Reno Tahoe’s brand. A similar tracking survey will be conducted in October 2018. During its July 26th meeting, the RSCVA Board of Directors unanimously approved a contract for Ranger Construction to refurbish the four main restrooms at the Reno-Sparks Convention Center. The largest replacements in the restrooms will include new ramp sinks, tile, ceiling grid and countertops. The RSCVA Board of Directors also unanimously approved a contract with Triumph Electric for the replacement of 512 existing exhibit hall light fixtures with LEDs. The new trade show exhibit hall lighting will be far more energy efficient than the metal-halide light that exists today. Also, the LED fixtures will provide a brighter white light for exhibitions. Funding for both contracts has been budgeted for in the capital improvement budget for Fiscal Year 2018–2019.